Republican grandstanding against Trump while backing nearly all of his policies isn’t resistance — it’s just a cynical PR move. More than a year into Trump’s presidency, there’s been no shortage of desperate hope that someone, anyone, will rein the president in. At one point it was military officials like James “Mad Dog” Mattis, who it was hoped would restrain Trump’s more bellicose tendencies. Instead, they urged him to be more aggressive. Then it was John Kelly, perceived as “the adult in the room” who would check Trump’s wantonness. Except nope, Kelly turned out to be just as politically extreme as the president. Yet the fantasy continues that at some point, West Wing–style, one of the Republicans who has been propping Trump up since he became the nominee will tell him that sir, they will no longer stand for this. So desperate are some to create this nonexistent bipartisan resistance to Trump that they have turned some of Congress’ most corrupt, heartless, and opportunistic members into liberal heroes based on a handful of middling speeches and votes. Just as with business leaders who offer toothless denunciations of Trump while backing his plutocratic policies, the GOP’s “resisters” are no heroes. Their records show precisely why it’s so dangerous to reflexively elevate any and every person who has happened to figure out that speaking ill of Trump is great for grabbing headlines. While not the first Republican to take a stand against Trump, arguably none have been more celebrated than Tennessee senator Bob Corker (at least until the theatrics of another opportunist further down this list). The millionaire conservative was heaped with plaudits from across the political spectrum when, in a moment of candor in September 2017, he warned of the chaos of Trump’s White House and the prospect that he’s bringing us closer to World War III. “I think the debasement of our nation is what he’ll be remembered most for,” Corker said. Corker was quickly hailed as one of the few Republicans with real integrity. Just last week, his local paper, the Tennessean, honored him as its 2017 Person of the Year. Inspiring stuff. But it’s easy to forget that until about the time he was no longer in the running for a job in Trump’s White House, Corker was a key Trump enabler. Despite his feints against Trump, Corker still supports most of Trump’s agenda. In 2010, Corker used his seat on the Senate Banking Committee to weaken the Consumer Financial Protection Agency’s ability to regulate payday lenders. In 2014, he helped scuttle a unionization effort at a Volkswagen plant he was opposed to by claiming on the first day of voting that he’d been “assured” the plant in question had promised to reward the plant with a new product if workers rejected the union. As Alec McGillis wrote at the time, Corker’s dubious claim — one that went against VW’s professed openness to a union — was influential in stopping the vote, and could well have helped kill the momentum for a string of other unionization efforts in the South at the time. Besides these highlights, there’s also Corker’s record of venality. Corker has a history of conveniently neglecting to disclose investments that appear to be serious conflicts of interest, as well as engaging in what looks suspiciously like insider trading. According to Matt Taibbi, Corker’s election to the Senate appeared to kick-start a successful career as a day-trader. He made hundreds of trades a year, including 93.5 percent of all trades made by legislators with access to finance industry information in 2014, buying stocks that suddenly shot up in price shortly after his purchase. Most recently, Corker was widely admonished for switching his vote on the tax bill after a clause that directly financially benefited him was slipped in, at which point he declared it “fake news” and personally told Trump he sympathized with him. Person of the year indeed. Maine senator Susan Collins, as one of the mythical “moderate” Republicans, is not as bad as everyone else on this list, though given the extremity of today’s GOP, that doesn’t amount to much. Collins’s “Trump Score” — the scorecard devised by FiveThirtyEight to track how often legislators vote in accordance with Trump — is 83 percent. The times she’s voted with Trump aren’t minor, either. She voted to confirm just about all of his nominees, from Jeff Sessions and Mike Pompeo to Steve Mnuchin and Ryan Zinke (Betsy De Vos and Scott Pruitt are notable exceptions). She also voted to repeal a rule requiring some federal contractors to report some labor violations and another rule that prohibited internet providers from sharing data about their customers’ activities, as well as against a resolution prohibiting arms sales to Saudi Arabia. And she voted for the GOP’s awful tax bill. For years, Collins has been using her status as a “moderate” and an “institutionalist” as cover for watering down or blocking some moderately progressive measures. After entering the Senate, Collins made lots of noise about how campaign financing was a major issue, naturally leading Russ Feingold to court her for his and John McCain’s Bipartisan Campaign Reform Act. She then made them drop a proposed ban on PACs. She likewise used her support for Obama’s stimulus to negotiate its price tag down and add more tax cuts. In 2009–2010, she spent months publicly suggesting openness to health care reform. Yet she never quite committed and eventually turned against it — always couching her opposition in a desire for the bill to be more bipartisan, to be scaled down, for Obama to scrap the bill and start from scratch a year into his presidency, or, at one point, complaining that the cost control measures in the bill she advocated for didn’t start soon enough to her liking. She ran the same game with the repeal of Don’t Ask Don’t Tell, publicly stating her support for it, then voting against it for procedural issues (though ultimately she did vote to repeal it). Her status as a “moderate” also provides a useful cover for some of Collins’s more extreme votes. She has always supported repealing the “death tax,” as she calls it, because of its supposed (read: nonexistent) negative effect on small businesses. She supported a provision barring Guantanamo detainees — up to a third of whom were falsely imprisoned — from challenging their detention in federal court, and later continually hammered Obama over the fact that the so-called “underwear bomber” was read his Miranda rights, a strange stance for someone supposedly concerned with procedure and institutions. And for all her moderation on abortion, she was key to Tom Daschle’s late-nineties attempt to restrict abortion access, convincing him to drop a mental health exception, an act that the Times portrayed as near heroic at the time. Another Republican who votes with Trump nearly all of the time, Alaska senator Lisa Murkowski is similar to Collins: she’s less extreme than the rest of the GOP but that doesn’t make her record all that much better. Murkowski started her Senate career under auspicious circumstances, when her father left his Senate seat to run for governor and appointed her to take over. Once in Washington, Murkowski went out of her way to prove she wasn’t a “Democrat in Republican’s clothes,” backing constitutional bans on gay marriage and flag desecration and opposing late-term abortions (an issue she’s since ping-ponged back away from the Right on). Where Murkowski has always shined, however, is on the environment, racking up a track record that would make Scott Pruitt proud. In 2010, she attempted to strip the EPA of its ability to regulate greenhouse gas emissions. She went as far as asking energy lobbyists to draft her proposal — clients of whom also made donations to her. When Murkowski managed to win a write-in campaign against the Tea Party candidate who had knocked her out in the Republican primary, there was speculation she might move somewhat left, having won with the support of some Democrats and environmentalists. Murkowski quickly put those hopes to rest. Since her victory, Murkowski has been a staunch supporter of Keystone XL, an implacable foe of restrictions on mining and oil drilling, and an ardent opponent of the United States’ forty-year ban on US crude oil exports, finally succeeding in repealing it in 2015. In 2013, she put forward a 121-page energy policy plan that included scaling back regulations, expediting fossil-fuel infrastructure projects, and redefining “clean energy” to include some fossil fuels. One of her long-standing goals was opening up Alaska’s Arctic National Wildlife Refuge to oil drilling, something she finally achieved last year with her vote for the tax bill. The somewhat incoherent lionization of Murkowski is perhaps best revealed by the issue of health care. Much of the fawning over Murkowski is due to her opposition to the GOP’s attempt to repeal Obamacare. Yet she has long supported repealing the Obamacare individual mandate, which many of its supporters view as key to upholding the program, and voted for the tax bill that gutted the measure. The mandate’s repeal probably won’t lead to the disastrous effects liberal pundits predict. But that doesn’t change the fact that everyone from Trump and the GOP leadership to Murkowski’s liberal fans think the repeal will hasten Obamacare’s collapse. Worse, the tax bill itself set the stage for long-planned cuts to Medicare and other social services. Even if Murkowski ends up opposing such cuts it doesn’t matter — her vote helped ensure they end up on the chopping block. 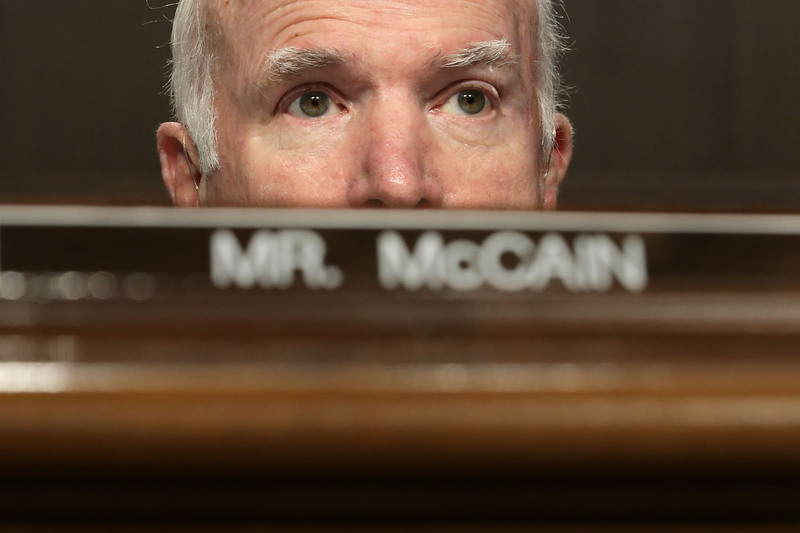 Is there any Republican who has been more consistently overrated by liberal pundits than John McCain? The terribleness of McCain’s actual voting record is well-trod territory, but it would be remiss not to mention that for more than two decades now, McCain has never met a war he didn’t support and actively push for. Afghanistan. Iraq. Libya. Go ahead and quickly Google any of those to see how they turned out for the people who live there. He’s also called for Israel to bomb Iran, pushed for military action in North Korea and Syria, jostled for military confrontation with Russia, and has been pushing for years to send weapons to the Ukrainian government. In fact, much of McCain’s opposition to Trump is couched in Trump’s perceived friendliness to Russia rather than any kind of principled opposition to most of his policies. One would think that the people who saw Trump’s comments about immigrants being rapists would be similarly appalled by this. There was also the dog-whistling extravaganza that McCain’s failed 2008 presidential run against Obama degenerated into. Give McCain credit though: he figured out a lot earlier than everyone else on this list that he could get away with voting for retrograde policies as long as he said the right things. The only thing you really have to know about Arizona senator Jeff Flake is that a mere one day before doing a much-hyped speech comparing Trump to Stalin and the GOP to Stalin’s enablers, he voted to expand Trump’s powers of warrantless surveillance over Americans. You might also recall that the day after a highly lauded retirement speech excoriating Trump (“This speech will be remembered not merely for its eloquence and its moral correctness but also for its intellectual content and its courage,” wrote one pundit), Flake joined his fellow #resistance heartthrobs Corker and McCain in voting with Trump to gut consumers’ ability to bring class-action lawsuits against financial institutions that rip them off. Those episodes pretty well sum up Flake’s counterfeit brand of resistance. But while we’re at it, we may as well go take a brief tour through the rest of his execrable time in Congress. Flake pushed for tax cuts in the early 2000s that were even more extreme than the ones Bush was proposing. Long chummy with big business, wealthy donors, and lobbyists, he tried desperately to repeal Arizona’s public funding law for elections (it was later struck down by the Supreme Court). He was one of only two of the House’s four-hundred-some members to vote against commemorating the fiftieth anniversary of Brown v. Board of Education, and one of four congresspeople to vote against extending jobless benefits. He voted against extending them again during the recession and told reporters he was “embarrassed” by Bush’s attempt to expand prescription drug benefits, which he spent years trying to derail. At one point, Flake’s popularity dipped, in his own words, below that of “pond scum” after he personally promised families of the Aurora shooting victims he would strengthen background checks for gun purchases, then turned around and voted to filibuster the eventual bill. Flake insisted on offsetting the cost of Hurricane Katrina relief with spending cuts and voted against Hurricane Sandy emergency relief, but was first on the scene bleating that FEMA wasn’t doing enough to help Arizona when it was ravaged by a wildfire one year later. Such hypocrisy is par for the course for Flake. He waged a war on farm subsidies, despite the fact that his family benefited from them for years. He was most famous for his career-long war on earmarks and irresponsible spending, but of course voted for the GOP tax bill that made a mockery of conservative hand-wringing over the deficit, even after a man suffering from ALS confronted him on a plane and told him voting for it would probably cost him his life. Flake’s years before Congress weren’t much better. Puff pieces on Flake note that his two years as a missionary in South Africa left an “indelible” impression on him, and that he still speaks Afrikaans. What they leave out is that in 1987, Flake testified against an anti-apartheid resolution in the Utah State Senate, explaining first and foremost that it could harm US access to its minerals, and that rather than every black South African being a “radical stone-throwing protester who will stop at nothing until the government is overthrown,” most were either “moderates” or “just don’t care one way or another.” Flake then went on to be a lobbyist for the South African mining industry, representing a uranium plant that had a reputation for discrimination and poor safety. Just before heading to Congress, Flake was head of the Goldwater Institute, which, besides being named after the man who opposed the Civil Rights Act and pioneered the GOP’s “Southern Strategy.” was a free market think tank instrumental in the spread of charter schools not just through Arizona, but the country. He later continued these efforts in Congress, trying to put a voucher system in place in Washington, D.C.’s school system. This is the man who prominent liberals hail as brave and are begging to run for re-election or set up a third party? A Goldwater-admiring hypocrite who’s spent his career attacking the poor while giving handouts to the rich, and whose resistance to Trump has comprised precisely two speeches? It’s not exactly hard to figure out what’s motivated Flake’s tepid acts of resistance. The real question is why people continue to be suckered by this obvious fraud. Some pundits will tell you it’s perfectly consistent to both think Trump is a threat to democracy and to almost completely support his policy agenda. It’s not. Making grandstanding speeches is not an act of resistance. It’s understandable in these strange times why people may be desperate to cling to the myth that a foundation of honor and decency undergirds US political institutions, and that when push comes to shove, politicians, regardless of their party affiliations and ideologies, will come together in some kind of act of holy bipartisan communion and do what’s right. But none of that is true. After more than a year of this, it’s time to stop elevating figures with odious records and ideologies to the status of heroes for doing nothing more than savvy PR.